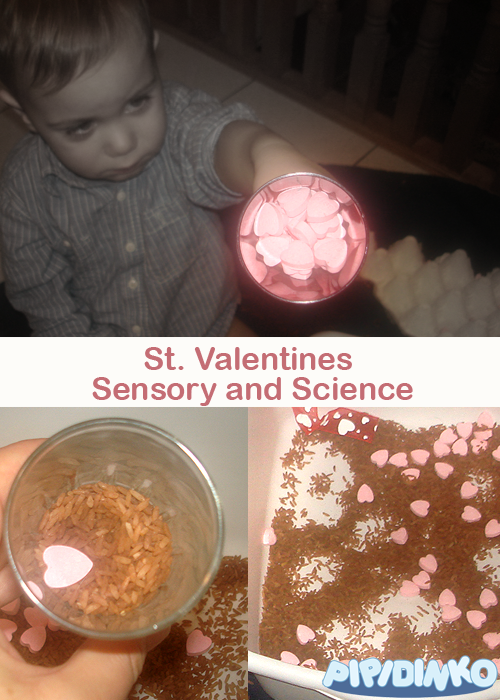 I arranged a little sensory experience for Santino. Basically, I used the chocolate rice from before and added some heart candies from the dollar store. 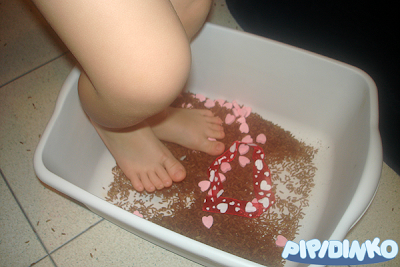 I didn't tell Santino, that those were candies and, luckily, he didn't try to eat them. 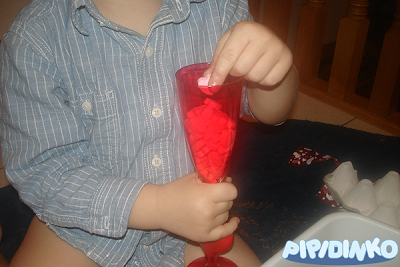 These candies came with a plastic cup, which worked great for playing. I try to expose Santino to the sensory play pretty much every day. This time I just added hearts to the chocolate rice for extra color, different texture and to expose Santino to the heart shape more. It's not like we naturally see this shape everywhere. Plus, I love brown-pink color combination; I hope he enjoyed it, too. I actually liked this kind of play: very limited in resources, which allowed him concentrate on the textures and colors and shapes. 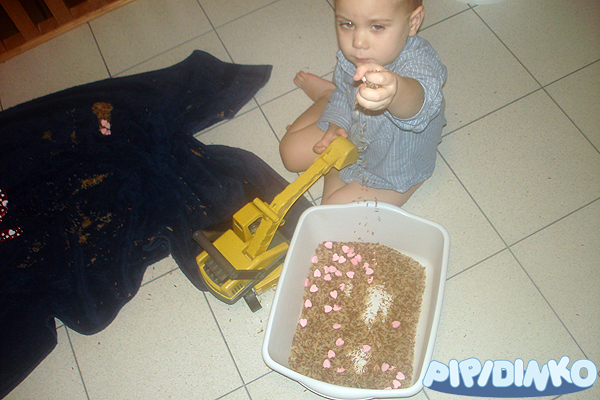 He started by trying to collect only rice in his cup. For a while I thought that's all he was planning on doing. Then he moved on to collecting only hearts. He did this also for a while: hearts in, then out. Then I offered him a little science experiment. I called it a magic trick, not that it mattered to him at that point. 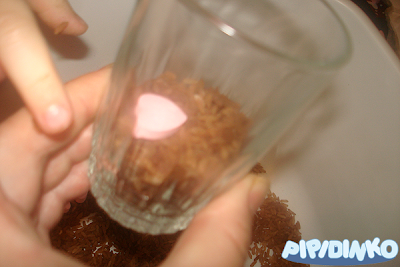 I grabbed a glass, and showed him how I put a heart on the bottom, and cover it with rice. Then I shook the glass and the heart, of course, surfaced after a few shakes. Santino loved this, he didn't understand it at first. I did it a few times, and he laughed and tried doing the same with his cup. He didn't have enough patience to shake it a little longer, but - yay! - kudos for trying! It was a long play, almost an hour! He stepped in the rice, tried walking in it. For some people this would be torture, for others - massage. 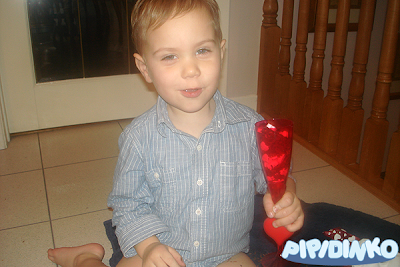 For Santino it was just a sensory experience! Then, of course, trucks and dinosaurs came into play. 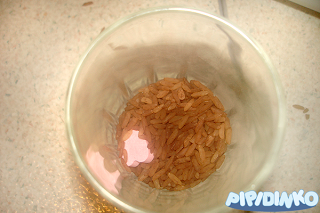 We added more rice, as the bin was getting empty. 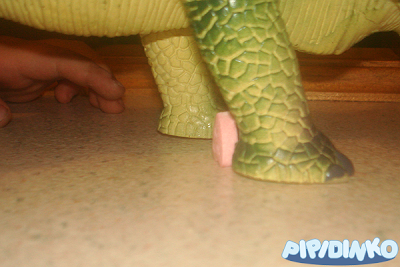 A dinosaur was trying to stomp the heart and break it into pieces. This heart was strong! 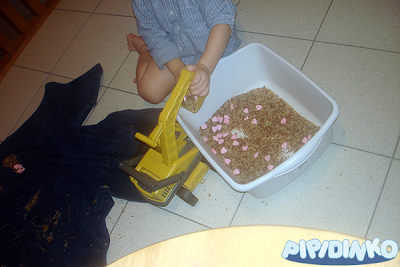 I love how simple things like rice make such a great activity for a 2 year old! 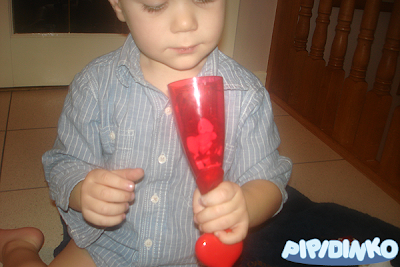 He created his own play, concentrated on it for a long time and had lots of fun. 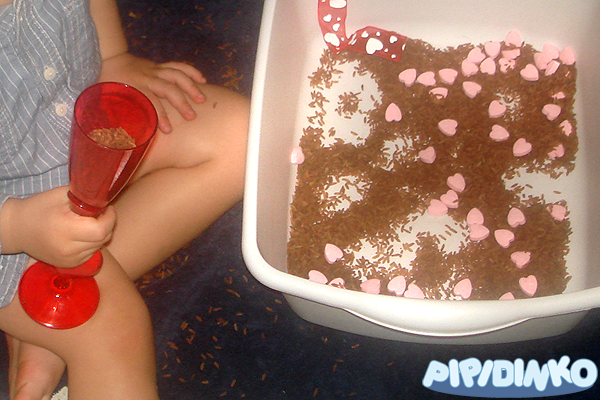 Looking for something to do with a toddler? Go for simple sensory fun, and just let the child to create and explore. There is no right and wrong in the sensory play, and there are so many learning opportunities! All he needs is for the parents to point them out.